WORK. the composer Fernando Román declared his love for this Paceña [lady from La Paz] with the famous taquirari [type of music]. Today it is interpreted in various versions. Her heart beat accelerated and her pale cheeks colored when she listened for the first time, the song which she was the undeniable muse. Elena Salazar had the youth to the surface when the Cochabamba composer Fernando Román Saavedra, inspired by her beauty, declared his love with the famed taquirari Collita [affectionate name to describe people who were from the highlands of Bolivia, in reminiscence of the Khollasuyo region, during the Inca’s Empire]. It was love at first sight and different span times. 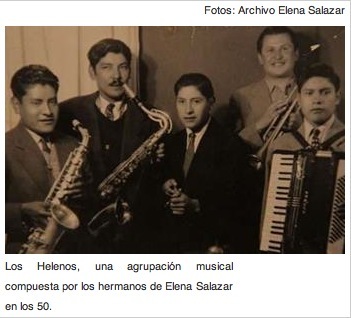 Mr. Román – as Elena used to call him for the 24 years that he was older than her – was going to his house frequently to give piano lessons to his brothers Efraín and Alberto Salazar, components of the music group Los Helenos [the Hellenes], who came to perform at inauguration of hotels such as the Radisson. They were casual but decisive encounters for the experienced teacher, who took him a couple of months to draw inspiration from this composition, which soon became the second national anthem of La Paz and whose interpretation, in different versions, is inevitable at the festive days in July. In front of the parents of this young Paceña, and on the same piano where taught music lessons, Fernando Román presented his song by way of asking her hand in marriage. Moved by so kind gesture, and satisfied with the melody, Elena – then had 18 years – decided to seal a pact with this man of 42, who was recognized in the musical field. “He was good and attentive, but also all tall, handsome, and green-eyed.” He asked to marry me because I liked to stay at home, and that he also liked, but I think it was very fast,” says Doña Elena looking wistfully at a portrait in sepia, which shows her smooth skin, and dark curly hair of yesteryear. Today, at age 81, shows white hair, but she dyes to remove a couple of years off. And although wrinkles marked her face, still retains the elegance of that era and that “deep watch” that captivated Roman. Although devoid of tools for love, Elena soon learned her role as selfless wife. Occupied in the lives of their new home, and always controlled by her husband, she had few opportunities to make social life. However, among the musicians of the 1950s, Elena – which at the beginning was known in society by her younger brothers’ band – had already won her fame as La Collita, nickname that goes with her until today. Listen to her song on the radio again accelerates the beating of her heart, evoking the day which was sung to her for the first time. She was carried out. She was a happy woman, albeit always kept a low profile. Although the memory fails her to remember important dates, like her wedding day, something that recalls with clarity was the way in which Fernando Román composed his songs. “We were sleeping and suddenly he got up and this time he wrote the song until he finished it. He dreamed of the songs, don’t know how, but consisted in a short time and only came back to sleep when ended it, recalls as she tries to recreate the scene with mimes. This innate composer, as well as his masterpiece Collita, was also recognized by cuecas Paso paso palomita and Madrecita, also known as Candadito de mi pecho, and Bandoneón querido in tango rhythm. In the Decade of the 1980s, this group [Wara] reclaimed, popularized the song from an original recording from 1954, which Uzquiano was able to do, because he [Roman] was his uncle. While the early years of marriage was idyllic; with the passage of time, the Bohemian life and the sexism of that era, Fernando Román became aggressive, womanizing and blind jealous. These were difficult years for Doña Elena, which was able to support a life of abuse, decided to divorce with the support of their parents and the two children who had to raise alone. It was not only the beauty that characterized this woman, but her soul of steel. She knew how to get ahead, at the beginning weaving rugs and embroidering tablecloths, and then attending a grocery store in Bolivar avenue. Despite this episode, her grandson Américo Estévez, known as the SAX Man, was the one who fought for the Bolivian society of rights of authors and composers of music (Sobodaycom) to recognise Roman as the creator of the song Collita, and also managed a plaque with his name on the avenida Camacho. “My grandpa was going to be forgotten, but is now recognized as the composer of this song. He was a great musician, but you know that the Bohemian life brings problems at home, and he just got carried away”, said Estevez with some caution. Uzquiano, on the other hand, recalls his uncle as a passionate artist about music, which put high cultural wealth of the country in all his compositions, even though he lived in Argentina. And though Elena never again knew about Fernando’s whereabouts [Roman], and never kept a photo of him, always returns to her memory when she hears “the song of her youth” on countless occasions. I remember playing this beautiful song to our two daughters, since they were babies as it was a way to teach them to be proud for being born in La Paz. For the full lyrics, please go to the link of the original Spanish article right above; those lyrics appear at the end of that article, thank you. This entry was posted in Art, Bolivia, Cochabamba, La Paz, Tourism and tagged Elena Salazar, Fernando Roman Saavedra, music. Bookmark the permalink. Gracias por escribirnos, pase un buen día!